Happy Father’s Day to all of our Fort Sanders Regional dads! We are lucky to have father-daughter duo Danny Kidd and Anetra Wilhoite on our team at Regional. 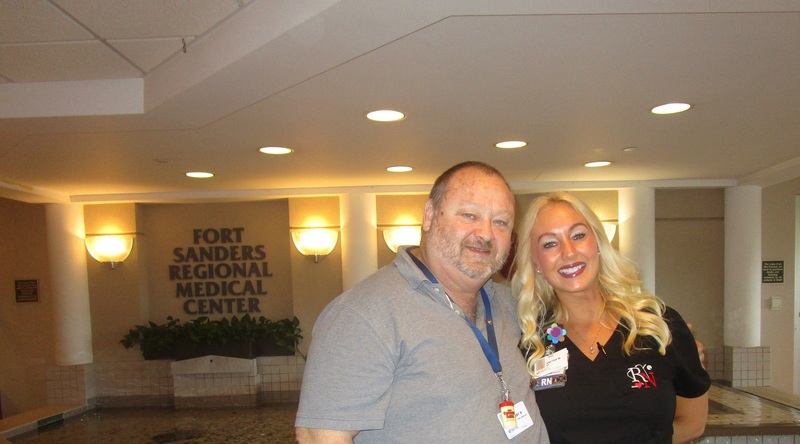 Danny raised his children to have a “servant’s heart” and is delighted his daughter has chosen a career in the healthcare profession. Danny is a teacher who works part-time as a patient care assistant, and Anetra is a registered nurse. Read more about Danny and his daughter Anetra below. What is your name and job title? My name is Anetra Wilhoite and I am a registered nurse for Knoxville Heart Group. My name is Danny Kidd and I am a PCA in the float pool. How long have you worked at FSR? Anetra: I have worked at Fort Sanders Regional for 11 years. Danny: I have worked at FSR for 9 years. What made you decide to work at the same hospital? Anetra: Dad is a teacher and wanted to work part-time somewhere, so I let him know about opportunities at Fort Sanders. What does it mean to you to work at the same organization as your father/daughter? Anetra: My mom actually works for Covenant Health as well as a few other family members, so we are just one big Covenant family. It’s nice to be able to occasionally go to lunch together or see each other on breaks when we can. Danny: The people in our family are caregivers, that why many of us work in healthcare because I feel that God wants us to serve others. As a teacher, I served by educating children and now I serve here at the hospital alongside my daughter. I am so proud of my daughter for getting her bachelor’s degree and becoming a nurse. She has been recognized and honored for the great service she delivers to patients. As a father, I’m delighted that she puts herself out there to help others. Anetra: My dad being my basketball coach. Danny: A triathlon we completed 15 years ago with our entire family.